"I love mankind! It's people I can't stand!" Praise the Lord and pass the plate! Of course you did, dear. Let’s fire up the old ansible and send an interplanetary happy birthday to Ursula K. LeGuin on her 84th orbit. LeGuin is one of those science fiction/fantasy writers who gets to be called “literary”; her work actually shows up in college literature anthologies — usually the short story “The Ones Who Walk Away From Omelas,” a fable about moral complicity in injustice that college freshmen usually decide has to be about communism, but that I’d really like to try using in a class someday in conjunction with some reporting on where iPhones come from. I've used "Omelas" this way for nearly 10 years now, on average once a semester or so (at least once a regular term, anyway). I point out that the rare earth which makes cell phones work (unless the technology has changed that much since I read the NYT Magazine articles many years ago) is extracted from mud in the Congo, mud gathered by hand by women who carry it in baskets miles through the jungle to a collection point, for which they are paid pennies. Without the rare earth in that mud, however, their cellphones would be paperweights (buildings no longer have windows that open, nobody knows what the hell a paperweight is, so maybe my comparison is inapt), and the manufacturers who get rich off such phones would go out of business. I make it quite clear their convenience rests on the misery of people in the "basement" of the world, yet we don't even admit they exist (which puts the people of Omelas one up on us). And the reaction from the students is the same: they still think Omelas is imaginary, and that they'd just walk away from it. 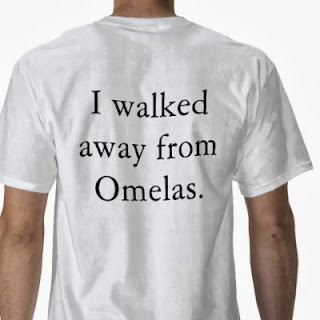 Recent submissions actually specified places they would go away from Omelas. Oddly, the popular choice seemed to be mountains: Colorado or the Ozarks of Tennessee. Every one his (or her) own Jeremiah Johnson, I guess. But never a clue about the interconnectedness of which Omelas is a parable, or how much we really are our brother's keeper, and what that really means. Such, anyway, is the power of parables. It's a great, haunting story, I of love the way you teach it. I haven't been able to walk away yet, though I discuss similar problems in my boringly-titled "Current Topics in Computing and Networking" course. E-waste, was the Unabomber on to something, Aaron Swartz, ethics, history, whatever. Gonna have to steal your schtick and include the story next time. "I of love"? Yes, yes I am, as are we all. Thank you. I teach it regardless; I just realized early on no scales were going to fall from eyes, no new thoughts would emerge full blown from their brows like Venus. Seems silly to have even expected that, but I figure they should at least be exposed to strange ideas. Oddly enough, at the same Wonkette link I found the YouTube upload of the PBS version of "The Lathe of Heaven." Toward the end one of the central points became "The greatest good for the greatest number." I found the pacing of the PBS show to be a little slow and it looks a bit dated now, but it was nice to see made. I just grabbed Dispossesed and Left Hand for my Kindle app the other day, which I'm really psyched to re-read. I hope I don't offend by pointing this out, but isn't "one person has to suffer so that we all can live in a heavenly utopia" a variant of the "Christ suffered on the cross so we all can go to heaven"? Oh, yeah. One more reason I don't like the atonement theory of salvation.